I was all over the Fashion Set when it came into Mac stores and my lovely mum treated me to this beauty. I'm a massive fan of mattes so I was so thrilled to see that all lipsticks from the collection were matte just like Ablaze. 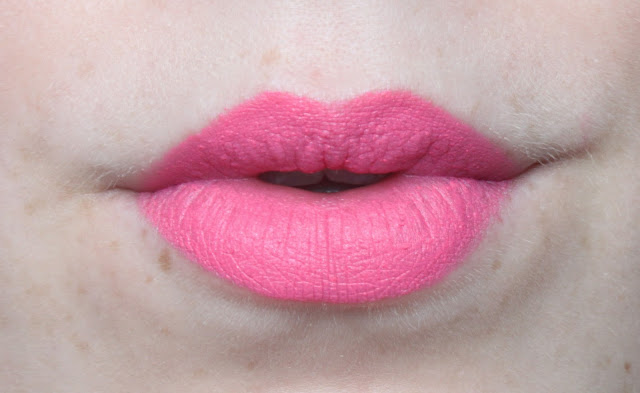 In the traditional Mac lipstick packaging, Silly is a true bright 'Barbie' pink. This shade of pink is pretty similar to Candy Yum Yum when I swatched in store, another one of my must haves, but slightly more pastely. It's almost a neon pink, but still has a slight subtleness to it, but this is no way for the people who shy away from bright colours - This will certainly add a kick of colour to any collection. I have worn this a lot with a smokey eyed look in the sunny evenings and it's perfect for holidays. Even though matte is my favourite finish from the Mac lipsticks, it's slightly drying and has a habit of clinging to some dry areas on the lips, so a good exfoliate before application wont do harm. Currently sold out online, you may be able to pick it up for £14 from your nearest Mac store. I wish they bought out more colours to their permanent line - So many that I would repurchase!! Definitely a Barbie pink! This is such a gorgeous shade! This is a gorgeous colour! I love mattes and pink so this is perfect! I really like this color! I might just get it next!